A tune with some hot rodding connections. 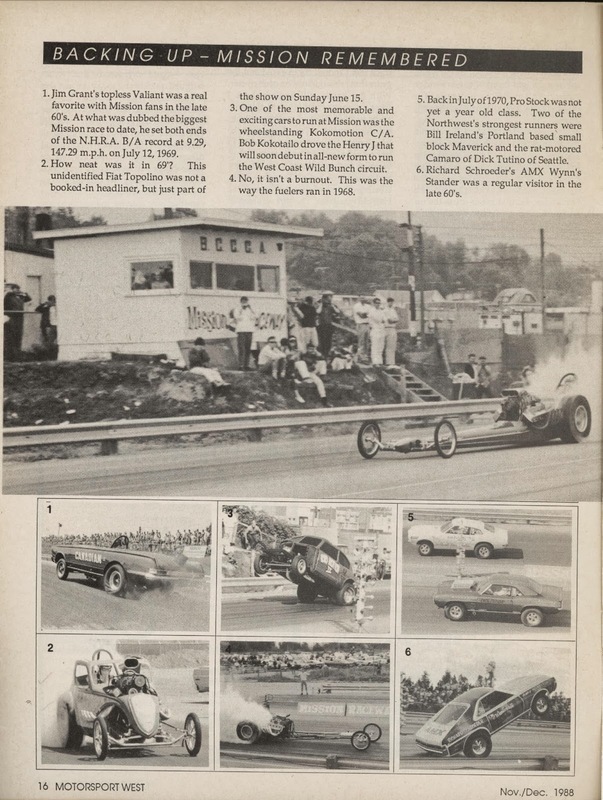 I see the Munster Dragula and a mention or two of woodies. Ah, ya takes what can gets. Photos from the 1973 Pepsi Pro Invitational. Been scanning like crazy. Lots of negatives done. 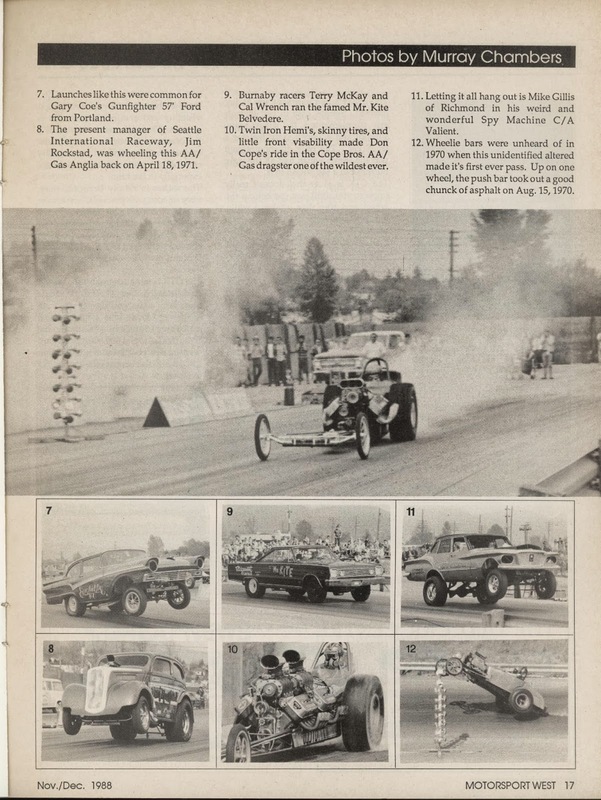 These are some more of the track roadster hot rods of the late 1940s and early 1950s. 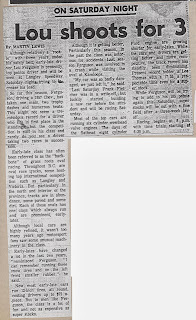 Two small looking vehicles featured on the pages of the Vancouver Sun in 1920. Found these ads in from the 1920s. 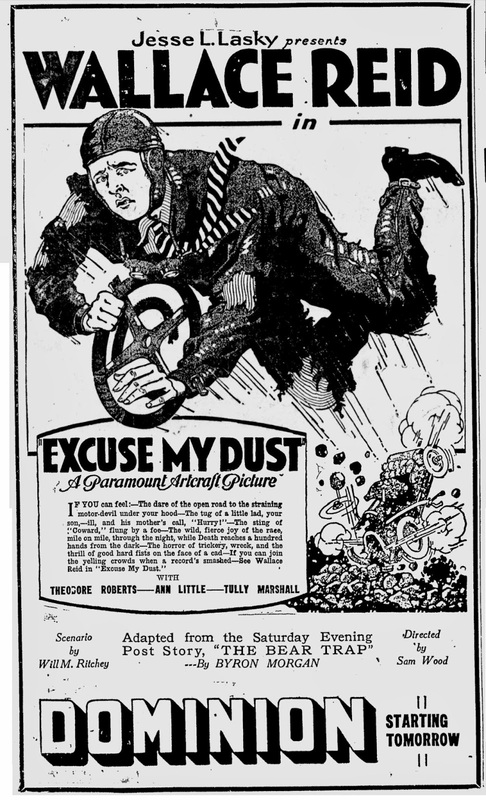 Wallace Reid often had automobile racing themed movies. With a Halloween theme. Mr. Gasser and the Weirdos, "Hearse With a Curse". 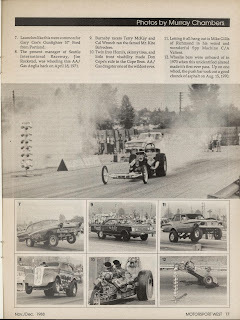 Chuck Robinson, who passed away recently, won a few races at the Abbotsford Airport drag races. 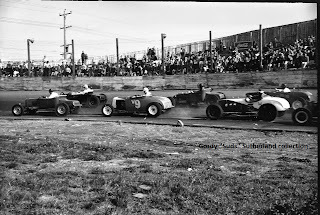 And there were other forms of racing going on out at Abbotsford. Motorcycles for instance. 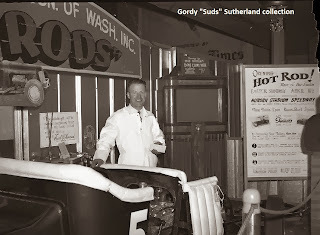 The Gordy "Suds" Sutherland collection is large, really large. "Bregg" is probably Gregg. 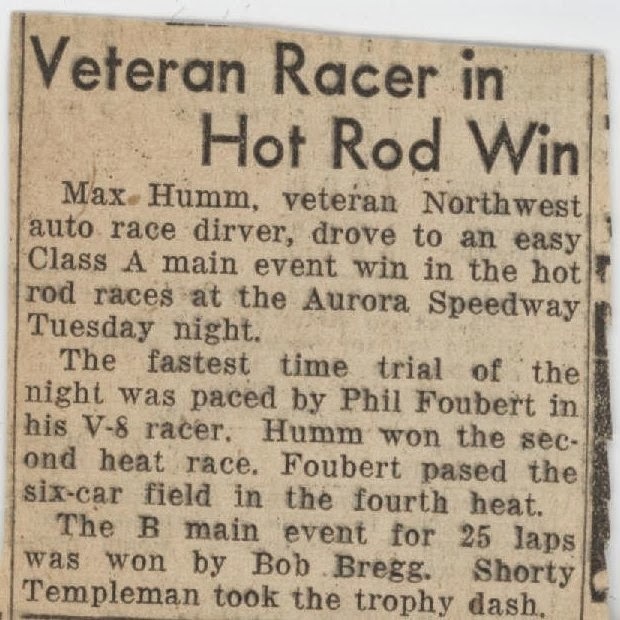 And Shorty Templeman went on to Indianapolis. An early Suds Sutherland track roadster. The Roadster Racing Association of Washington came up to Digney Speedway in Burnaby a few times. The Roadster Racing Association of Washington at a Seattle Auto Show, circa 1951. 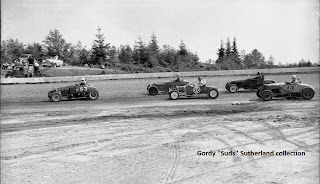 A photo of the track roadsters on a Bremerton, WA, dirt track, circa 1951. 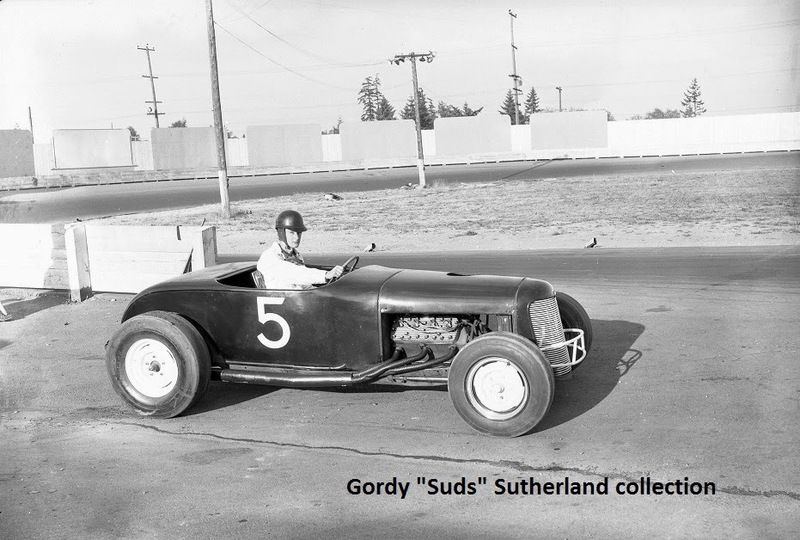 The "hot rods", track roadsters, raced up and down the coast for a few years after the Second World War. I've finally started scanning some negatives given to me a few years back by the late Don Radbruch. Don is one of the inspirations for this blog. 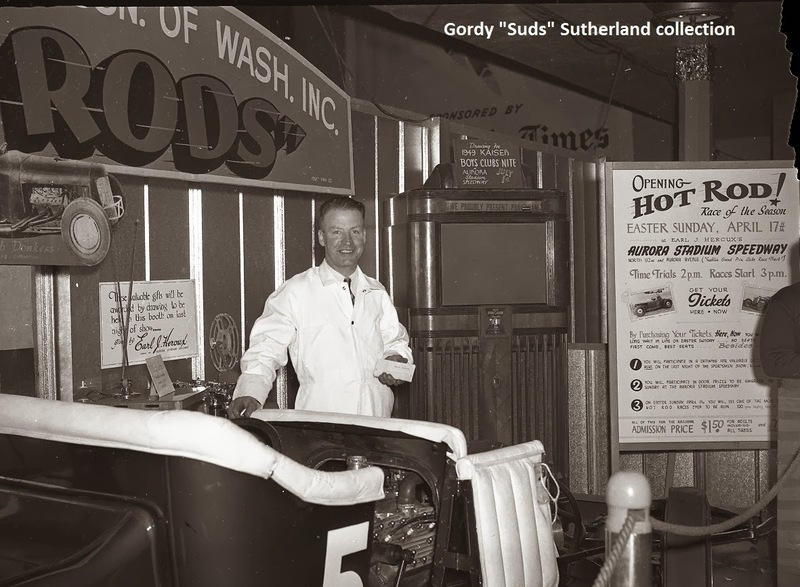 So to honour him, I better get these photos from the Gordy "Suds" Sutherland collection scanned and some of them online. 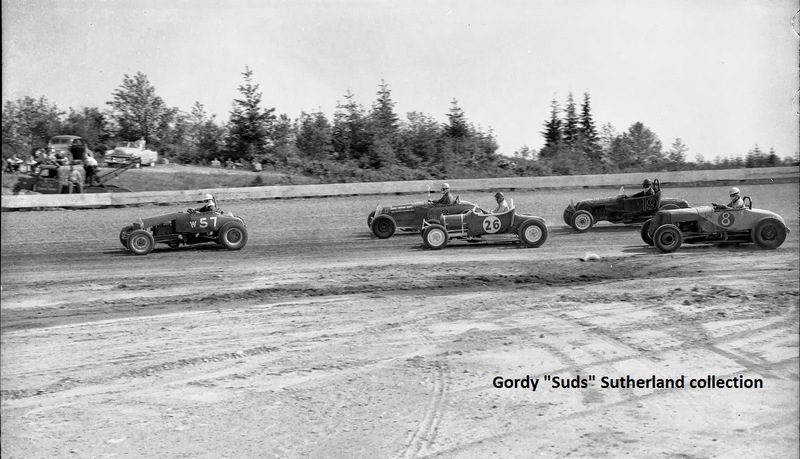 Two from Aurora Speedway, just north of Seattle. The information, especially concerning heat race results is sadly lacking. Not sure if I'll ever get it sorted out. 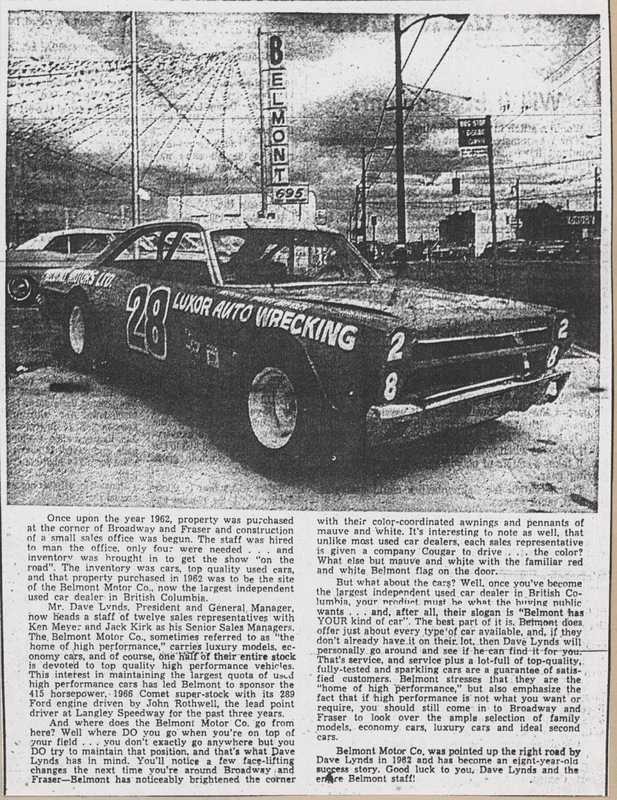 But here is the Saturday, August 8, 1970 results of super stocks and early-lates. 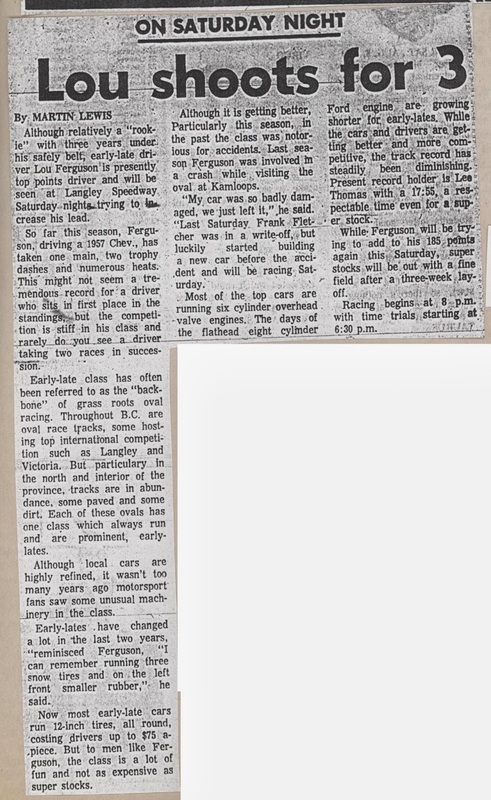 A look at the early-late class, specifically Lou Ferguson. Dennis Corfe lost a wheel during one of the mains. Lester and Rothwell crashed near the end and one of them finished 3rd. Two different reports have two different 3rd place finishers. Next report I find will be the tie breaker. 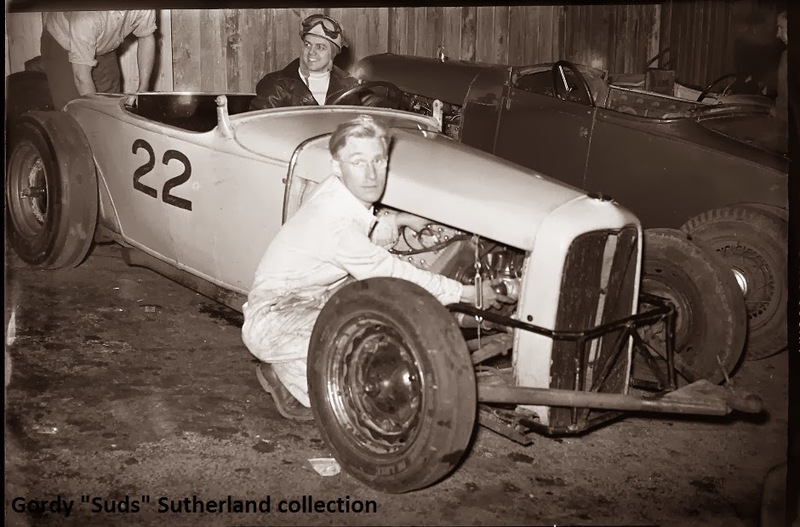 Bill Strachan, Bill Godfrey and Ken Sayers tangled. Godfrey and Sayers out. I've seen ads for the Chrysler thrill show at Lansdowne Park in Richmond and The Willows in Victoria circa 1937. 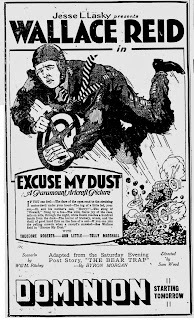 This film seems to show what the thousands who paid good Depression-era money saw. 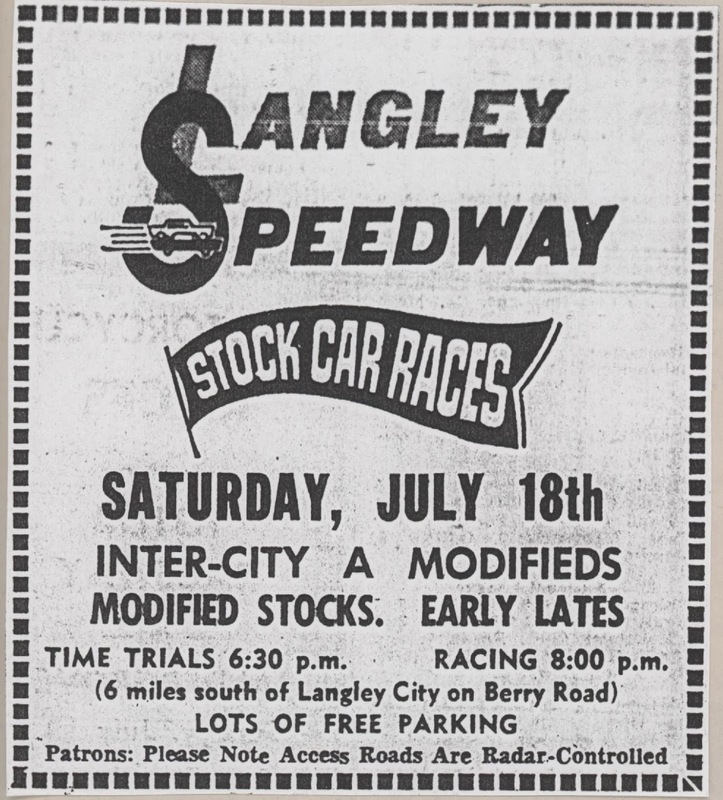 It would appear that the Saturday, July 25, 1970 race scheduled at Langley Speedway was rained out. 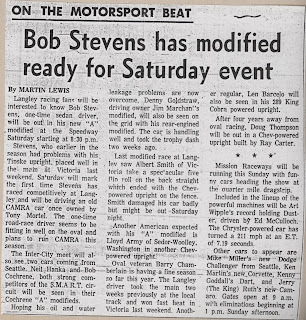 So we jump a week ahead to Saturday, August 1, 1970. 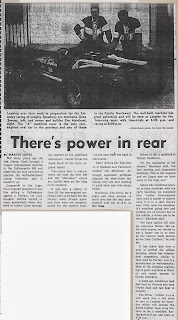 Story on the Jim Marchant rear-engined supermodified. 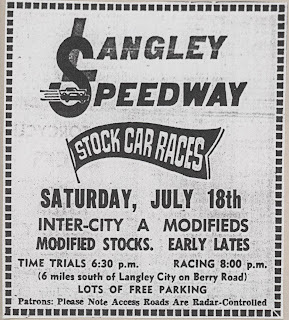 A modifieds, modified stocks and early-lates. 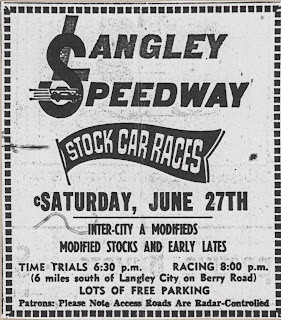 Back to some regular Saturday night racing at Langley. 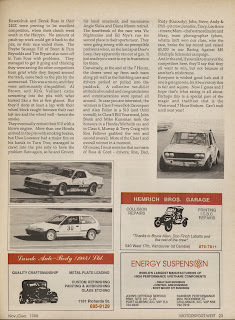 The Intercity modifieds were featured. 72 cars in the pits. Barry Davies crashed into back straight wall. 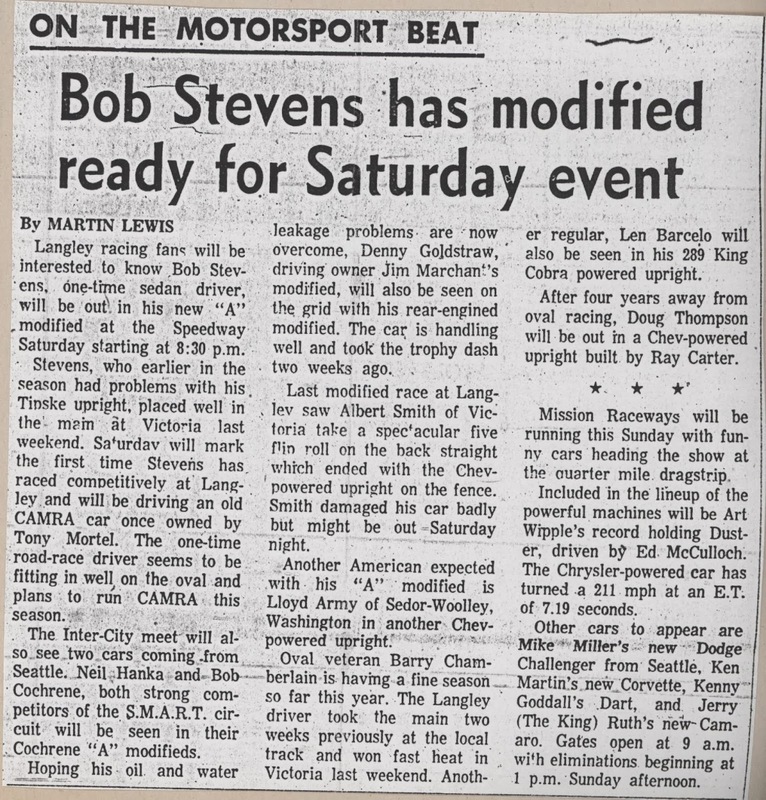 A big mid-week event, part of what would become known as the International Drivers Challenge (IDC). 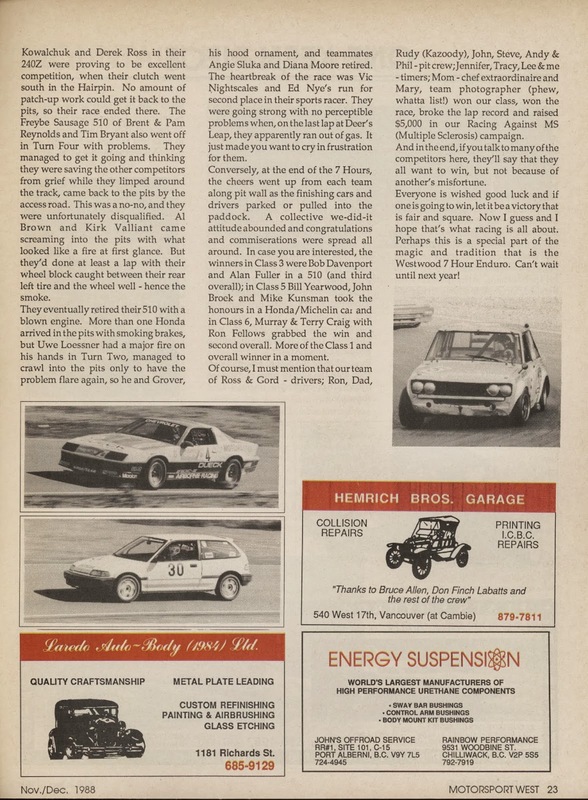 There were two variations, super stock and supermodified. 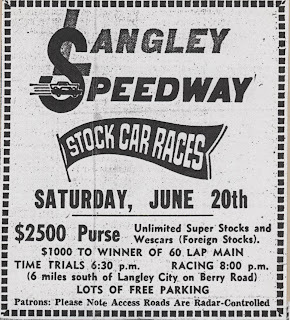 This is the first IDC super stock race held at Langley. 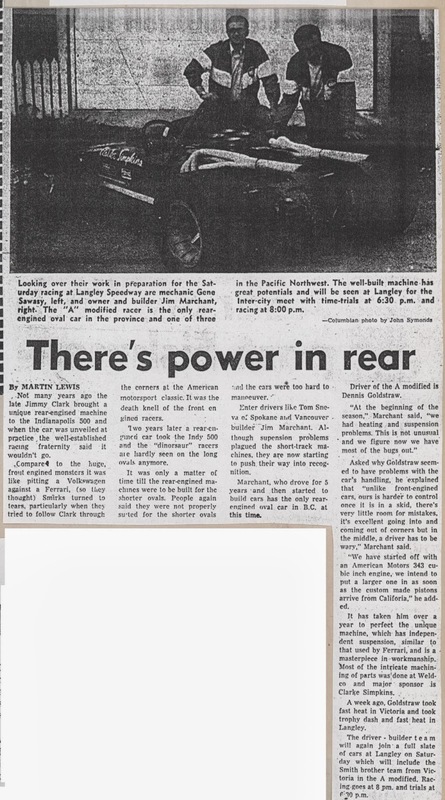 Clippings from the Columbian newspaper. 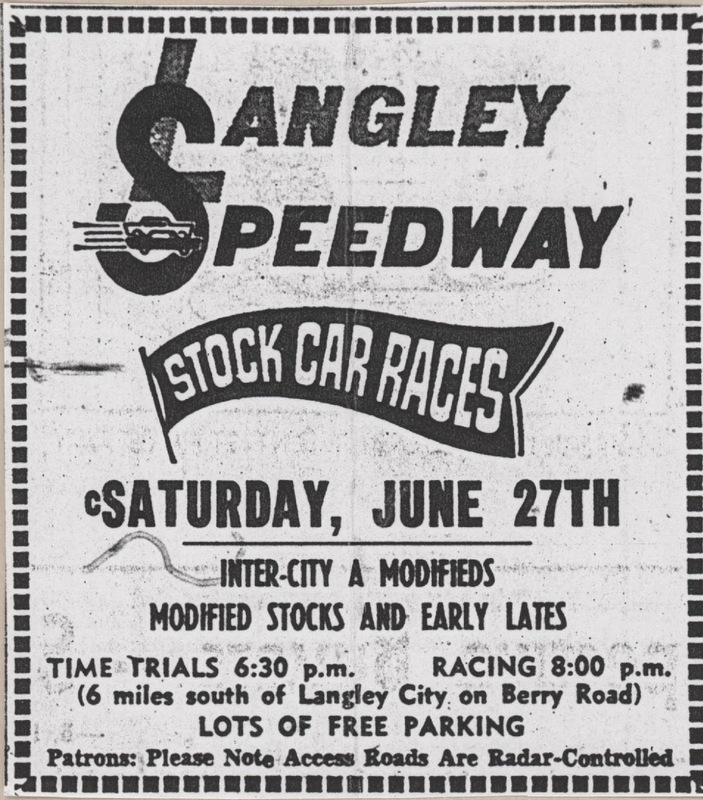 Part of the Langley Speedway Historical Society archives. Over 40 super stocks in attendance. Lap 9, Bill Hunt and Barry Tukula crash. Both are out. Harold Hardesty and Bob Warman crash lap 3. Lap 5 Rick Adsit, Jim MacMillan, Jack Knight, Gordie Hemrich and Ken Sayers crash in turn one. MacMillan out. Sayers missed a few laps. Hemrich had rear damage. Saw it a couple weeks ago. I see it's still in the theaters. Well, that's good. Also read Niki Lauda's book from the late 1970s. 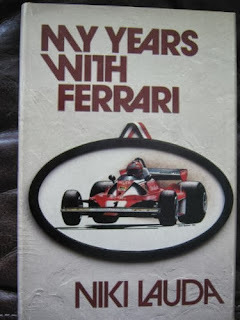 Found it earlier this year at what seems to have been a bargain price (although still above the listed cover price from back in the day). Another Saturday night race but the results are poor. I find these because some drivers made it up to the Champ car circuit so better information on them was gathered. This day Ed Crombie of Williams Lake. 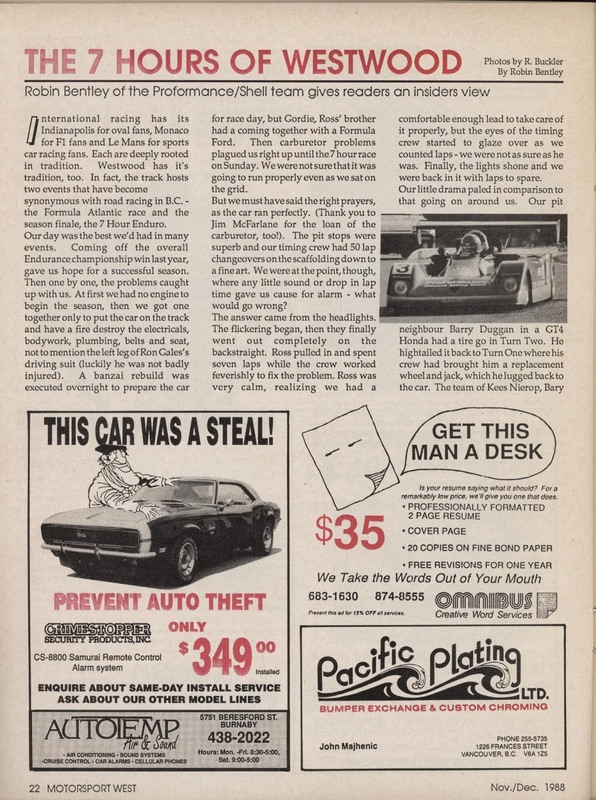 Ed Crombie (b. October 13, 1945 in Williams Lake, British Columbia) is a former Canadian-born United States Automobile Club Championship Car racecar driver. He made four starts with a best finish of 7th at Mosport in 1977. 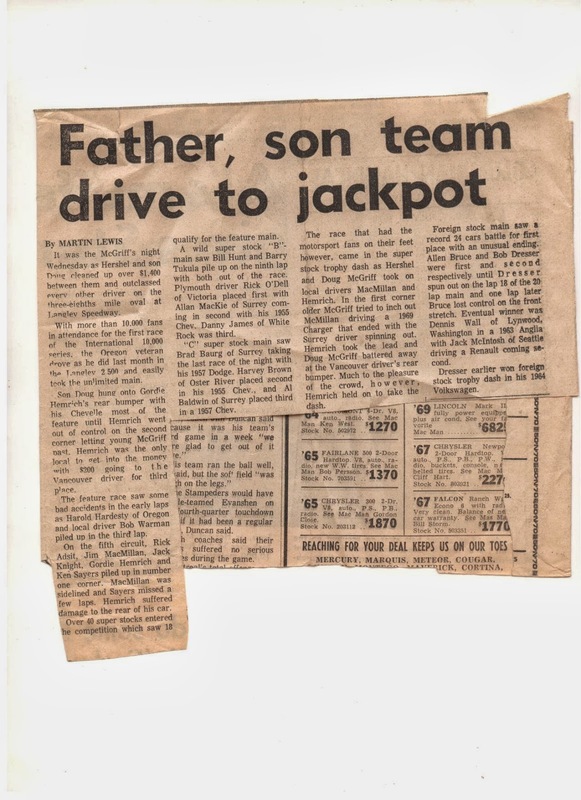 He failed to qualify for the 1977 Indianapolis 500. The Westwood (and now Mission) Historics have had some pretty good covers. The artwork is always worth keeping them for years after. But I was going to do that anyway, right? Don't have many birthdays on record so when one comes up I should recognize it. This time Ed Kostenuk, whom I've noted in previous posts. 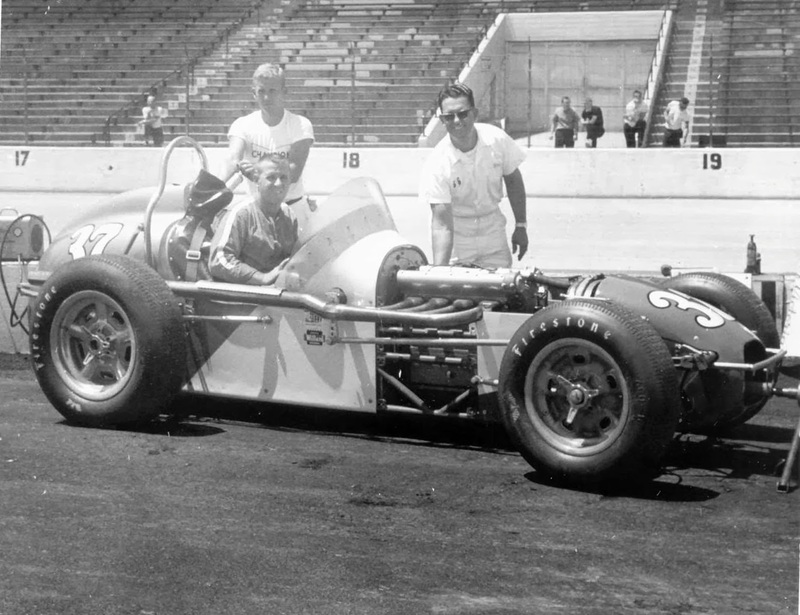 Ed Kostenuk (born on October 12, 1925 in Victoria, British Columbia - died on September 2, 1997) is a former USAC IndyCar racecar driver. 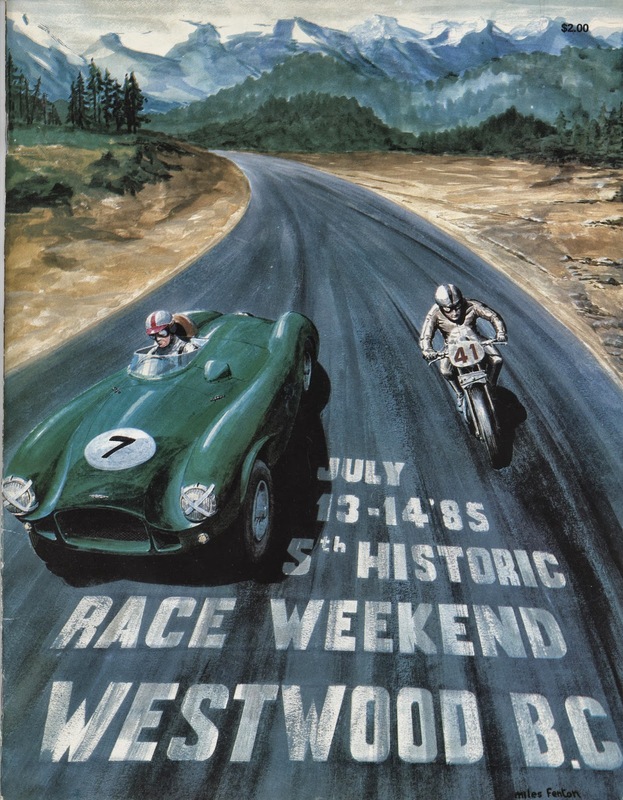 He made six starts from 1962 to 1964 with a best finish of eleventh place. 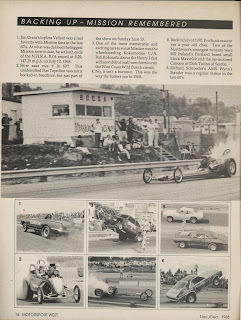 He failed to qualify for the 1962 Indianapolis 500. Some photos "borrowed" from the web. Ed Kostenuk's champ car at Milwaukee. Ed Kostenuk in the cockpit with Vi Scovell. Golden Wheels collection. 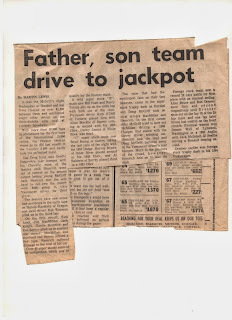 His Victoria Auto Racing Hall of Fame entry can be read here. 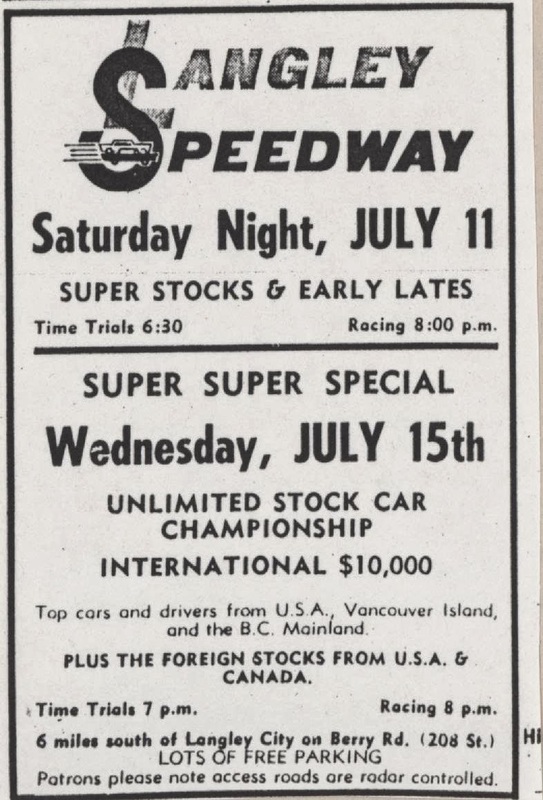 Looks like at least Portland Speedway and Aurora (Seattle). Might be another track as well. Great footage from the late 1940s. And some good hot rod music. The big Sea Festival races with a few familiar winners. John Erickson, Butch McCormack and Bill Strachan crashed. McCormack and Strachan out. 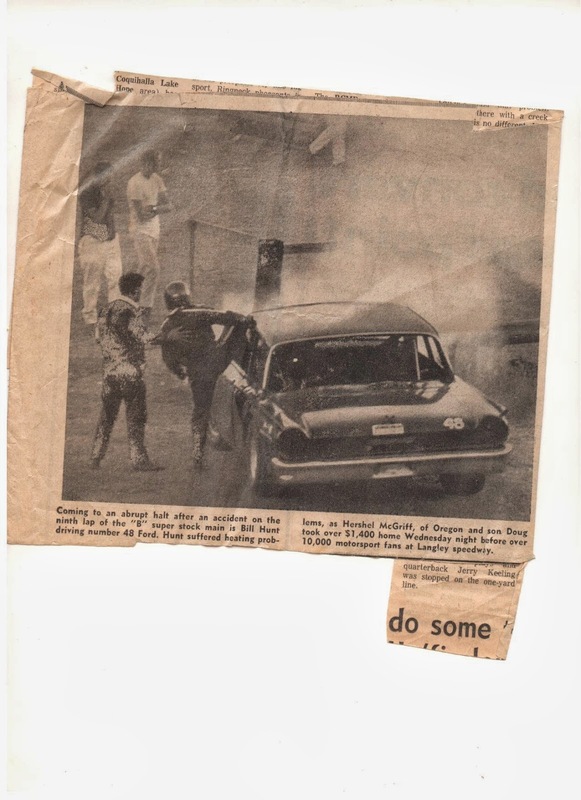 Jim Fleming lost wheel and sparks caught gas tank on fire. He got free and was okay. First start: Jim McMillan and George Cook tangle. Restart, lap 2: McMillan spun. Next restart: red flag for McMillan, Cook and Danny James -- McMillan out. Hemrich was second until he spun on lap 30. Seven car accident on lap two. Three cars out. On lap six Gerry Wandler hit the cement wall and careered into the pits. Larry Lodge started main. Caught fire. 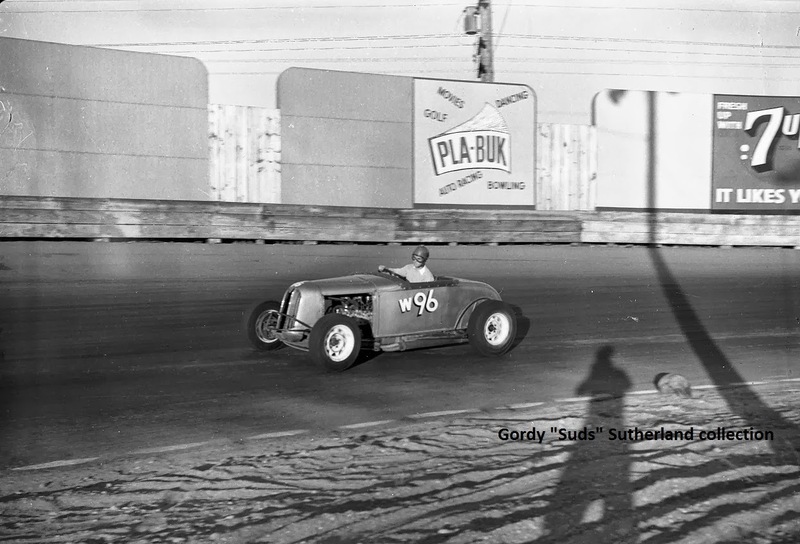 The fire was put out by the started and Lodge resumed the race. 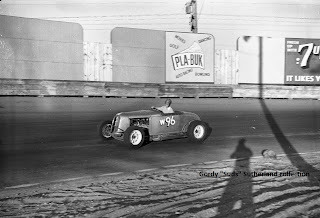 Number 44, Gerry McLees, 301 Chev. 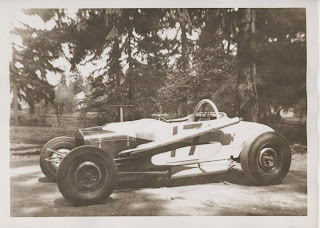 Number 92, Levie Jones, Puyallup, WA. Upright 427 Chev, fuel injected. Timed in a 15.39. He was leading in the heat race when he lost his front wheel and axle. 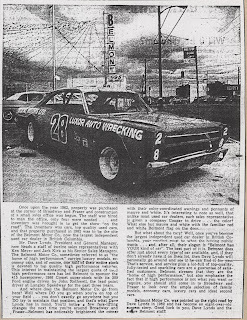 Car was repaired but did not run in the main. 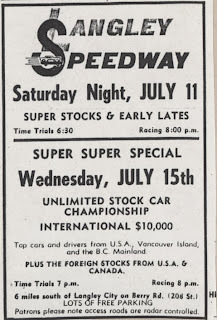 An unlimited super stock race with foreign stocks as the supporting group. Over 40 cars at the race. Hershel McGriff, Bridal Veil Falls, OR, won $1100. $100 for fast time (16.40) and $1000 for the main win. By less than a bumper over McGriff. Rick Adsit led most of the race. He had to pit with six laps to go. 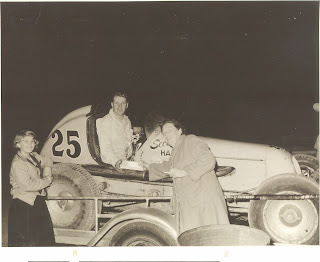 Bill Hunt, Ray Mackie and Ken McCauley crashed early with Hunt out with front end damage. Wes Henham’s car caught fire on lap six. McGriff lapped all but the three fastest cars. 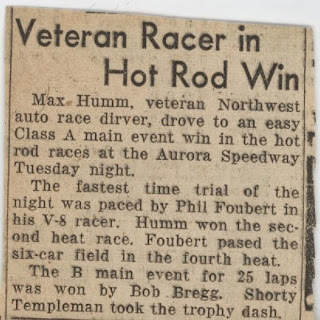 He left for Kent, WA, for the Hilton 200 which he won. 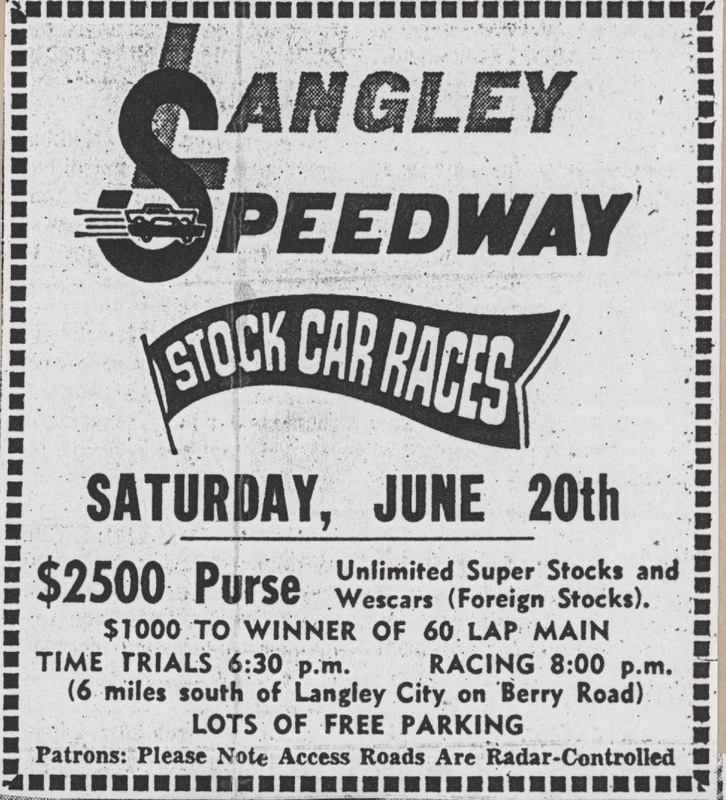 After a brief break I'm back with some more from Langley Speedway's 1970 season. Some pre-race info on modifieds. 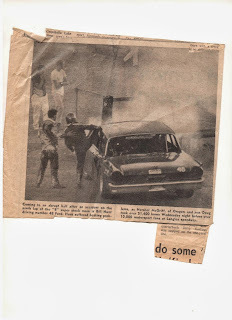 Bob Stevens involved in a three car wreck in the fast heat. DNS main. Cal Arnold took lead on lap 12, and held it until two laps to go. 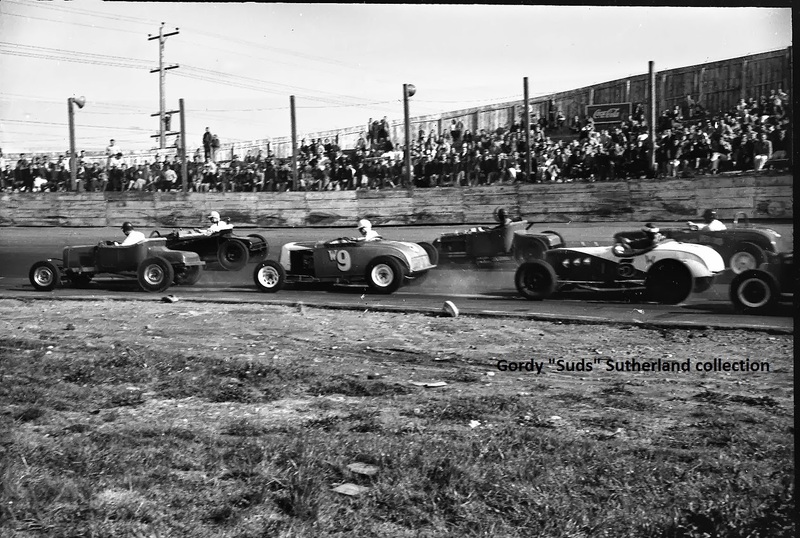 On lap one Len Barcelo, Don Selley, Dennis Goldstraw and Cal Arnold crashed in turn one. Barcelo was out for the rest of the race. Some good shots of Mission from the 1960s and 1970s. Working on the theory that 25 years ago is "history". I suppose yesterday is as well.